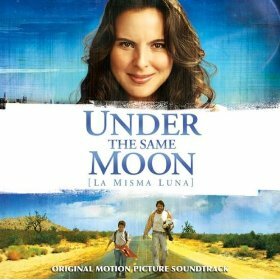 Under the Same Moon – also known in its native Spanish as La Misma Luna – is a road movie with a twist, about a young Mexican boy named Carlitos who, following the death of his grandmother, must find a way to cross the US-Mexican border to find his mother, Rosario, who has been living and working illegally in the United States. The film is directed by Patricia Riggen, stars Kate Del Castillo and Adrian Alonso, and features an original score by Italian composer Carlo Siliotto. Despite having gained a little bit of international fame following his scores for The Punisher and Nomad, Siliotto remains a little bit of a peripheral figure in the film music world, but I sincerely hope that this changes soon, because Under the Same Moon is gorgeous. The opening piece, “La Misma Luna”, is an innocent, sun-kissed dance for solo piano, strings and accordions that is just captivating, and continues on into a slightly mournful duet between acoustic guitars and flutes in “La Fantasia de Carlitos”, which is just lovely. The entire score is underpinned with a prominent harp element which waves away in the background, giving the score a delicate internal rhythm, and a sense of lightness that, despite the tragic circumstances Carlitos and Rosario find themselves, keeps you believing that everything will turn out OK in the end. There are a few moments of darkness and melancholy, in cues such as “La Cancela”, “La Muerte de la Abuela” and “La Mano”, which use basically the same instrumental ensemble, but beef up the bass to add to the drama; elsewhere, “El Coche” adds a more prominent percussion element, in what is the score’s most threatening cue. However, as Siliotto gradually builds towards the end of this sadly short album, the orchestral beauty returns: cues such as “Los Trabajadores” and “En La Cama Con La Luna” are wonderfully optimistic and romantic pieces, while the conclusive “El Semaforo” wraps everything up into a nice, tidy, and emotionally satisfying package. Unfortunately, Siliotto’s score is not available for purchase in stores, but can be obtained as a digital download from Lakeshore Records via iTunes.